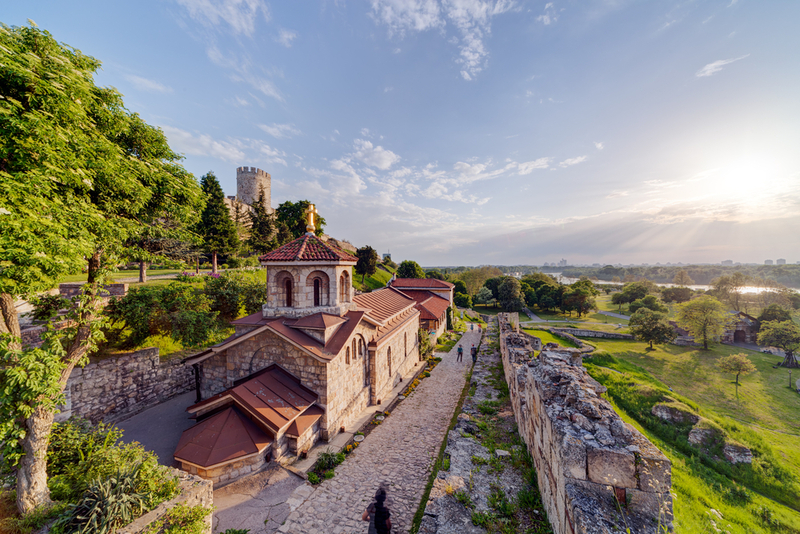 Belgrade (Beograd: ‘white city’) was named for the gleaming walls of its fortress, set majestically high above the confluence of the Danube and Sava rivers. This is the perfect spot for river cruisers and city breakers to begin exploration, gaining bearings, appreciating sublime panoramic views and setting foot upon the oldest settled area in this most ancient of European cities. 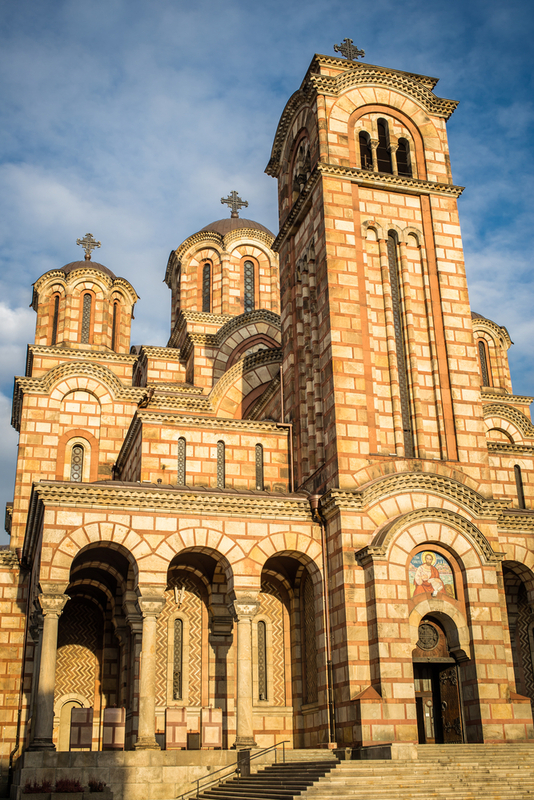 So coveted was this location that Belgrade holds the dubious honour of ‘most destroyed city in the world’ – razed to the ground no fewer than 44 times in 16 centuries, and by some exceedingly talented exponents of devastation, from the Huns to the Nazis. The legacy of this turbulent past is a now-engaging jumble of architectural remnants. Within the fortress alone may be found Roman foundations, 18th-century case-mates (housing a gruesomely comprehensive collection of medieval torture instruments), an elegant fin de siècle park and a Cold War-era military bunker. Beside it, a wander around the Old Town reveals down-at-heel baroque mansions cheek-by-jowl with gloomy socialist realist tower blocks, richly-stuccoed Art Nouveau apartments and graceful onion-domed churches. If anything can be said to define such a city, it is an indefatigable spirit of reinvention. And with a population supplemented by 10,000 students, Belgrade today presents an overwhelming impression of youth, vibrancy and confidence unencumbered by the sins or baggage of the past. Settle down for an al fresco lunch and a glass of rakija at one of the myriad delightful cafes near Republic Square and you can count on a parade of infuriatingly beautiful bright young things unfolding before you. Add a little spark to your first afternoon with a visit to the small but enthralling Nikola Tesla Museum, celebrating the life and achievements of the true father of electricity and one of Serbia’s favourite sons. On display are several originals and copies of Tesla inventions such as the induction motor, but the Tesla coil steals the show, creating on demand a 500,000-volt crack of lightning and enough atmospheric charge to illuminate fluorescent tubes in the hands of delighted visiting schoolchildren. 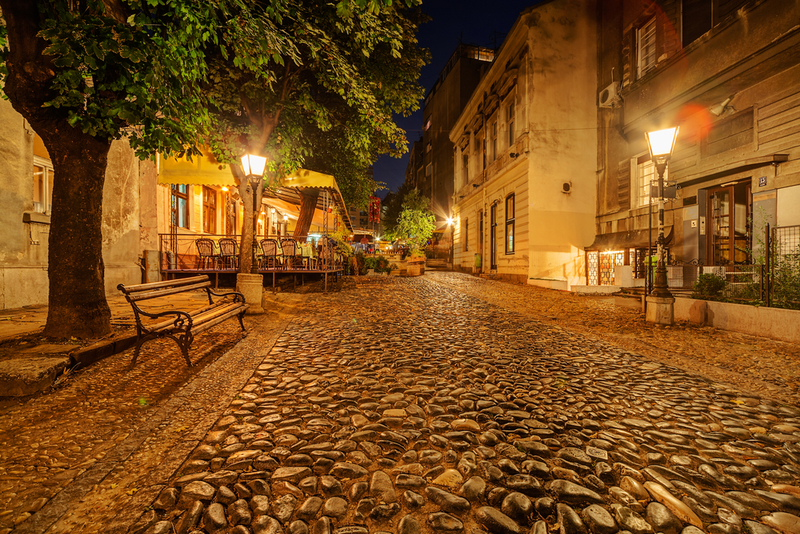 A short taxi ride away is the cobbled street of Skadarska, once the heart of bohemian Belgrade, but now best known for its many excellent taverna-style restaurants including the grand DvaJelena, which serves up mouthwatering Balkan specialities such as telefaforba (veal broth), cevapi (spiced lamb sausages) and vinogradarske (gratinated crepes) to the accompaniment of excellent local vintages drawing on a heritage of viticulture stretching back to the 3rd century, when Serbian wine was favoured by the emperors of Rome. The bill comes as another pleasant surprise – even for a blowout three­ course meal for two, expect to pay as little as £30. No opportunity for after-dinner fun is knowingly missed in the ‘party town’ of Europe. Even in the darkest days of bombing during the Kosovo War, squares and bridges were transformed into vast outdoor concert venues and nightclubs popped up everywhere – perhaps most bizarrely in an Austrian gunpowder storehouse where the DJ set his decks on a 2,000-year-old altar and Roman sarcophagi vibrated to the beat. Belgrade nights still last as long as your energy reserves and its clubs are by no means the exclusive preserve of the young, so don’t be afraid to head out after dark and follow the music. A gentler alternative though is to search out one of the city’s numerous ‘hidden bars’. These speakeasy-like dens, not advertised at street level, may be found in apartment blocks, basements, and even churches. Perhaps the finest and most famous is the Federal Association of Globetrotters (also called the World Travellers’ Club). In the late I990s, when embargoes prevented Serbs from travelling abroad, this clandestine club was formed to inspire cultural exchange. Eclectically decorated with knick-knacks from every point of the compass and indulging the owner’s taste for I 930s jazz, it is still a delightful and relaxing place to enjoy a cocktail or two. 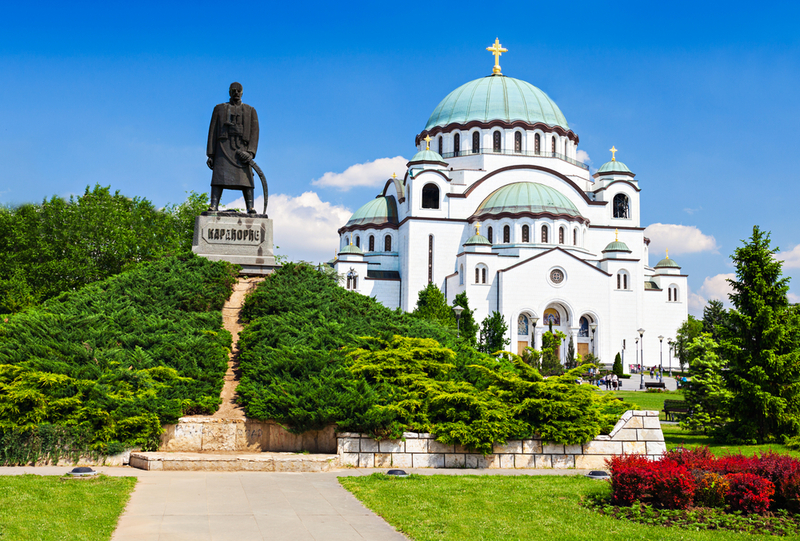 River cruise itineraries generally allow for a single full day in Belgrade – but, if you can spare another, there is plenty more to see. Every weekend from April to November, the descendants of the last king of Serbia throw open the doors of the Royal Palace to visitors. Guided tours, which must be booked in advance and include transfers from Nikola Pasic Square, take in the elegant 1920s Serbian-Byzantine style residence and an overview of its extensive grounds dotted with pergolas, pools, terraces and pavilions. Back in the heart of the city, amongst the imposing buildings of government , Monument restaurant makes for a friendly and memorable lunch stop, particularly if you like a good steak. Hold off on dessert though – there is another essential Serbian experience to appreciate. You are never more than a few minutes from a cake shop in Belgrade, as befits a city once part of the Austro-Hungarian Empire, and the sublime gateaux and pastries on offer should be sampled at least once. Look out for thepekara sign on any main street, or treat yourself to coffee and a slice in the iconic and luxurious surroundings of the Hotel Moskva (around £ 15 for two). A couple of afternoon hours away from the hustle and bustle in one of the city’s many green spaces should aid digestion. The Jevremovac Botanical Garden is something of an urban idyll, with 1,000 species of exotic plants and trees. Or, if the weather is fine, do as the Belgradians do and head to the teardrop-shaped Great War Island, situated between the Sava and Danube. This lush mini-wilderness comprises a protected nature reserve, recreation area and tourism zone, complete with lido beach at the islet’s northwest tip. Thus reinvigorated, conclude your stay in style with dinner at Little Bay, a restaurant rather unassu ming on the outside but designed within to resemble a baroque opera house, complete with curtained private boxes. Here, budding classical musicians and singers perform sonatas, concertos and arias as diners savour superb interpretations of classic dishes from boeuf bourguignon to confit duck pithivier. Such places confirm the sense that the more time you spend in the Serbian capital, the more you are sharing in a crazy, wonderful secret. It may not be postcard-pretty, but it has a charm, fascination, and depth of character which would be the envy of more celebrated European cities, if only they knew. 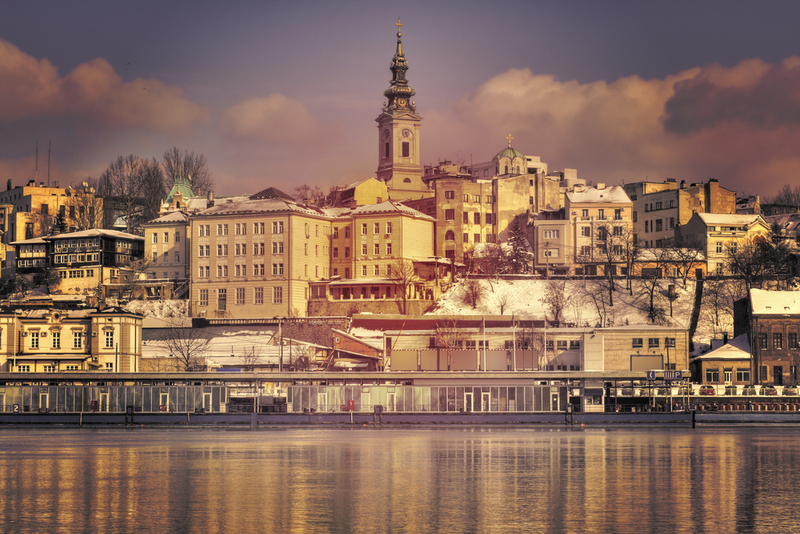 Belgrade really is a pearl of the Danube; just one formed around a little more than the usual grit.